SC is the highest court in the Philippines established on June 11, 1901. 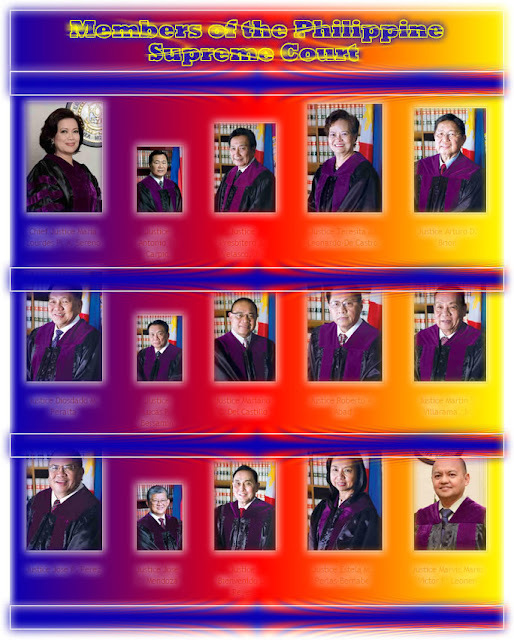 The Supreme Court is composed of one Chief Justice and fourteen Associate Justices, all of whom are appointed by the President from a list of recommendees presented by the Judicial and Bar Council. The Constitution of the Philippines vests judicial power in one Supreme Court and such lower courts as may be established by law. [Section 1, Art. VIII, 1987 Constitution). The members of the Supreme Court serve during good behavior until they reach the age of 70 or unless removed by impeachment for any of the grounds provided by the Constitution. Here are the 15 current members of Philippine Supreme Court (SC). *Information below are subject to change upon updating.